Thanks for coming out to this year's Birds of a Feather Festival. Keep checking back for details on next year's event. 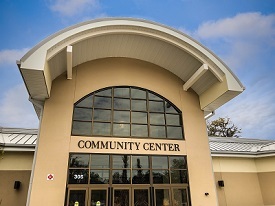 Returning for the 5th year, we’re excited to announce this year’s Festival is now located at the beautiful and redesigned Palm Coast Community Center – 305 Palm Coast Parkway Northeast. It's almost time for the 2019 Birds of a Feather Fest – Feb. 7-10 in beautiful Palm Coast, Florida! With more than 125 miles of hiking, biking and walking trails, miles of coastline, varied habitats and more than 200 identified species, Flagler County is a birder's paradise. Few places offer as many wonderful opportunities to enjoy nature while being so connected, accessible and clean. With a focus on families, beginners and experts alike, this festival offers something for everyone. Our fun 4-day birding and nature festival invites everyone to enjoy a weekend of birding, photography, workshops, social events, and family activities. Join National Audubon Society’s David Ringer for a FREE keynote event. Also enjoy: free beginner bird walks every 2 hours on Saturday and join us Saturday Evening at the Community Center for the Meet the Experts event! Palm Coast, Florida - located off I-95 between Daytona Beach and St. Augustine and just a short drive from Jacksonville or Orlando. 7 Big Trips Featuring trips to Merritt Island National Wildlife Refuge, Sweetwater Wetlands, Orlando Wetlands Park, Circle B-Bar Reserve, Ocala National Forest, and all over Flagler County for our first-ever Big Day!